Marcia Tiffany's Double-Walled Ceramic Vessels - Marcia Tiffany says of her dramatic ceramic pieces: “Something about double-walled bowls intrigues me. I am drawn to think of them as ceremonial vessels that honor the similarities and polarities in nature, art and ourselves. 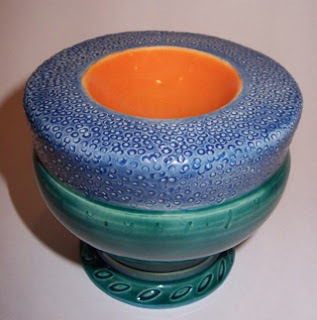 I think of the hollow space between the inner and outer shapes as the place where the spirit or breath resides.” Marcia uses contrasting colors, highly textured and smooth surfaces, and size relationships to express and evoke the symbolism of these vessels, partly inspired by the ceremonial vessels of various cultures, including containers for sacred objects and holy water. Nick Johnson's new assemblages - Anyone who has seen Nick’s work knows that his 3-D creations are delightful, sometimes political, often absurd, masterful, and ridiculously inventive. Edgard Camacho's unique ceramic designs - Edgard, who has been a painter and sculptor, is showing a collection of ceramic pieces with marvelous geometric facets, unique design features, and great color palettes. The remarkable dresses of Charlotte Forbes. These dresses are art pieces, made to hang on the wall and not be worn. They are utterly fascinating—three styles made entirely of used teabags, with their gorgeous gradations of tea-color (tea itself removed). These dresses are poetic and romantic and offbeat. 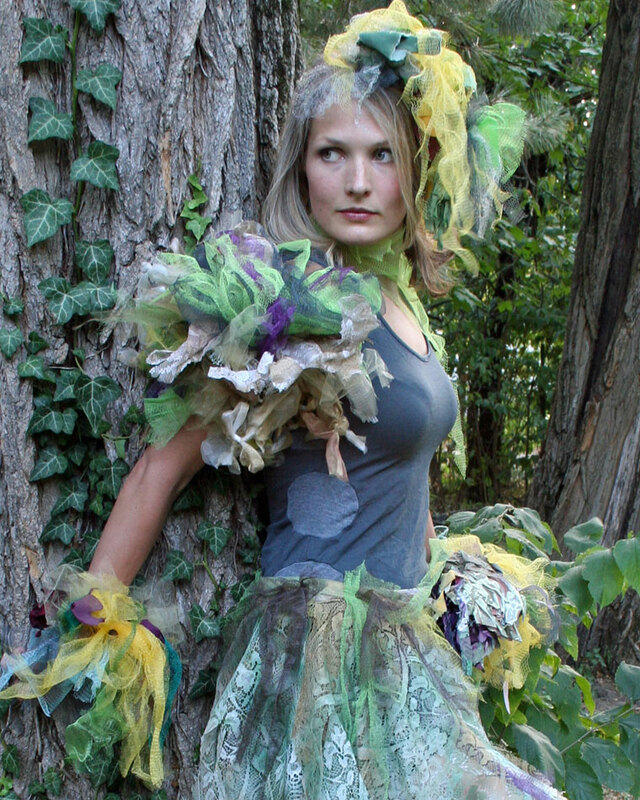 Another dress is made completely of crumpled paper towels that were used as paint rags. It's quite beautiful. Charlotte lives in New York but visits Fairfield regularly. 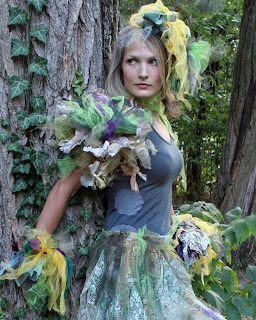 Continuing are the fashion-inspired mixed media works by Olaya Veras with their brightly colored inventive designs and the incredible costumes created by Judy Bales from the most unlikely materials. Genevra Daley Bell has also added some more new Spring animals—charming ink and watercolor illustrations that are well-loved. Art Walk night, Friday, May 3, also includes a studio activity of ongoing , ever-changing tabletop installations. Everyone can participate in these transitory works of art.